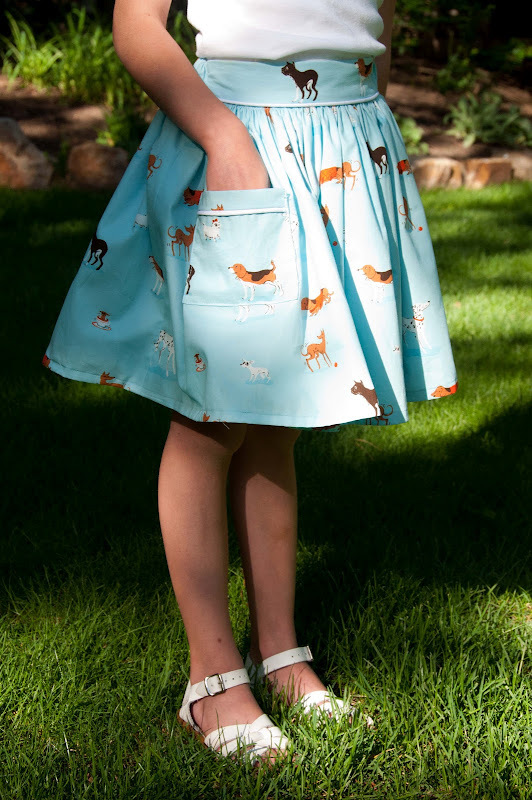 A skirt with dogs and a piped waistband and a piped pocket. 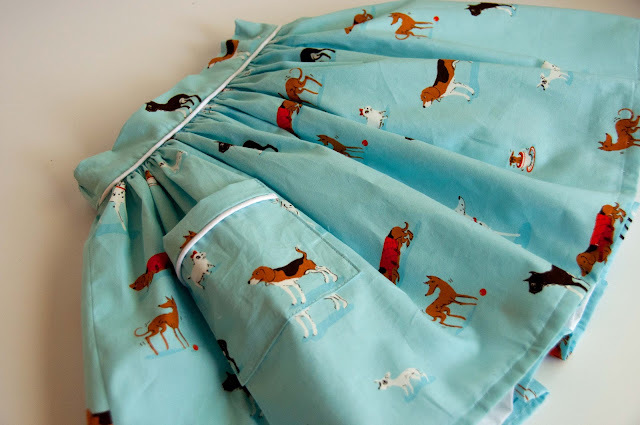 A skirt with dogs and a piped waistband and a piped pocket and a full white lining. It's 88 inches of this beautiful Heather Ross Lightning Bugs Dogs on Blue fabric and I love it. It has that 1950s shape to it: tight waist and then lots of fullness. I've decided when it comes to little girls a bit of elastic is essential so it has a gathered back waistband. And I think the piping adds the right amount of punch. 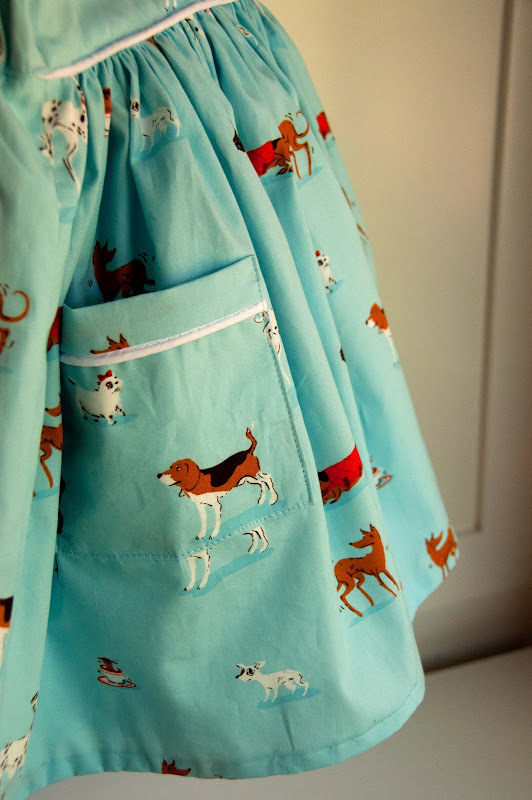 A piped pockets can add so much, and it's really not that much more trouble than a regular pocket. You'll need two squares of fabric, one for the outside and one for the inside of the pocket. The size is up to you. This particular pocket is 4.5"x4.5". 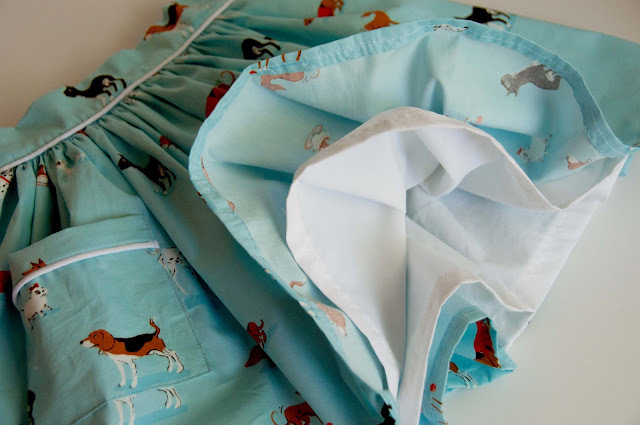 If you are using a print with an "up" orientation you'll want to flip the inside fabric around 90-degrees before placing them right sides together. This is because the "inside" fabric is what you see above the piping on the outside of the pocket, and you will likely not want it upside down. Now sandwich the outside square of fabric on top of this stack of piping and inside fabric right sides together and pin to hold in place. Stitch the top of the pocket through all three layers as close to the piping as you can get. It's a roughtly 3/8" seam allowance. I have a zipper foot that works great for piping. Now lay the "sandwich" back down and stitch the bottom seam. Turn it right sides out. Now you are going to rotate the seams so that the piping appears about a 1/2 inch below the top of the pocket and press the top and bottom of the pocket to mark this placement. Be careful to press the seam allowances flat, away from the seams. I'm showing you the "outside" (on the left) and "inside" of the pocket so you can see what it looks like. The piping should be laying down from the top of the pocket (be certain to press the piping seam allowance towards the top of the pocket). Turn the pocket inside out again and pin right sides together using the pressing marks at the top and bottom of the pocket to maintain the rotated seams. Stitch the side seams of the pocket but leave a 2" opening on ope of the sides for turning the pocket right sides out. Turn right sides out. I like to roll back the fabric casing on the piping and trim a bit of the cording so it's not to bulky in the seam allowance. Press being careful to press in the opening you left in the side seams so those raw edges will be caught when you stitch the pocket in place. That is it! Pretty slick, right? There may be another method but this is what I worked out and it made sense to me! Now you just place the pocket where you'd like it and top stitch around the sides and bottom very close to the edge. Enjoy a bit of piping!